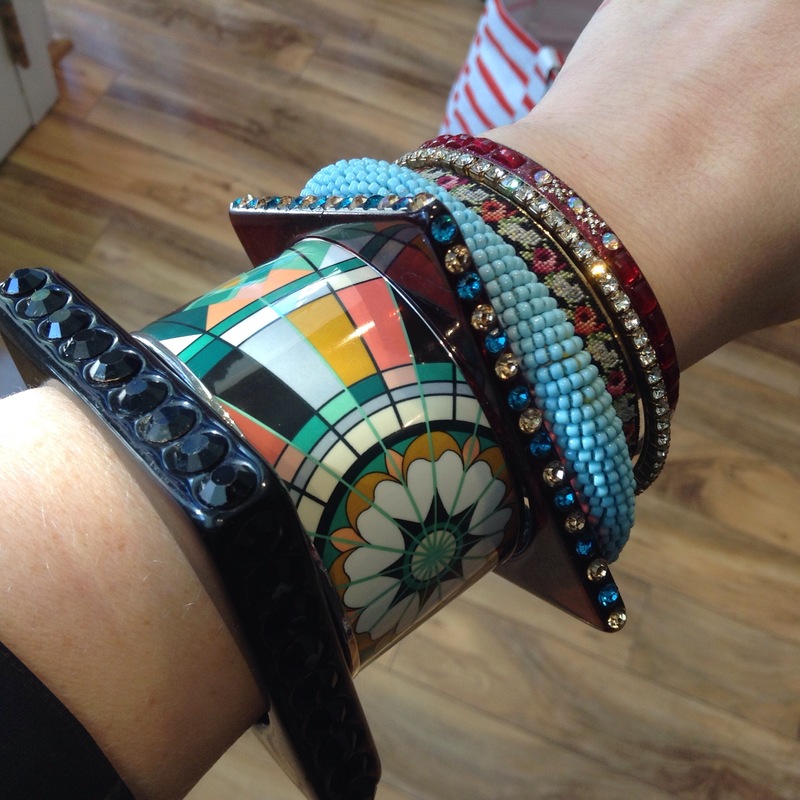 Today I am wearing a rather excessive amount of bangles, even by my standards. Maybe because I have a lot of work to do in the shop? Yesterday was my personal checklist day (everything completed woohoo) and today is the work checklist. 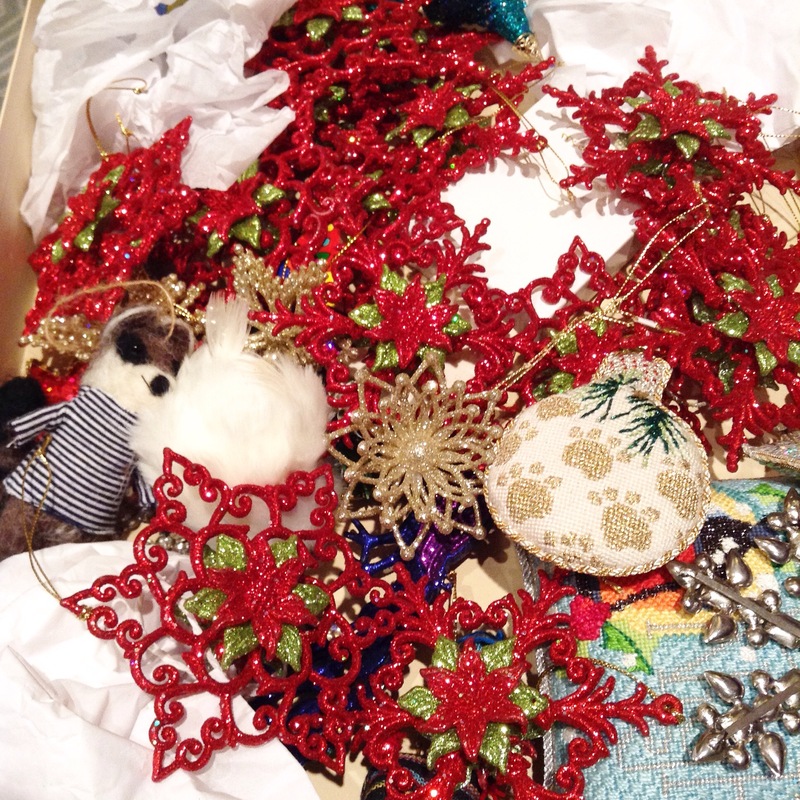 Undoing Christmas is so sad, isn’t it? My instagram friends will recognize this pic. We took down our tree last night now I must dismantle the 4 trees in my store. How long do you keep yours up for? Today’s bangles: black bakelite, Hermès Rose de Compas, multi color bakelite, blue beaded, petit pointe needlepoint bangle, swarovski bangle, red rhinestone bangle from India. I asked my husband that exact thing last night! If you come up with something, let me know! Oh how I missed this bangles posts!!! Rocking the New Year #blogmom! I would say some AC/DC turned up as high as possible. And…. I gasped out loud when I saw your bangles today…..ohhhhhh so beautiful. All things sparkly make me very happy 🙂 my mom says I’m like a crow like that. I love the groovy 70’s flower power one that is so pretty! Thanks! That one was from all my brothers for my birthday. I like imagining the one who was sent to the store to pick it out trying to decide on the pattern. I know that pic! Taking down the tree is such a drag because I went ahead and made all that space for it…now that I have to take it down, I will have this huge gaping hole alongside my wall. Nope, not for me. Ain’t gonna do it. I love the fact you have a store, that you enjoy decorating your life, including your arm and you have a lot of the same creative ideas that my oldest daughter has, but she is trudging along in the trenches. Her spirit will take flight one day, carrying her into her true calling. Meanwhile, thanks for getting me smiling, especially about my being your Mom! ha ha! Awww, thank you!! Good luck to her daughter- life is hard sometimes, isn’t it? But I hope she finds and or makes a good path for herself.